Sadie had her first sleepover last night, and for Dylan it was the first for quite a while (I think since before Sadie was born!). 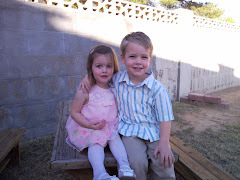 They stayed over at Katie and Pat's (Titi & Uncle Big Guy) with their cousins Sam & Hannah. Sadie actually DIDN'T cry (she seems to be going through a phase of separation anxiety lately) when we left and Dylan had fun hanging out with his cousins, watching a movie, and staying up a little late like a big kid. Scott and I got to have dinner at a restaurant with a wait to get a table, hang out in the bar and talk while waiting, and take our time eating. We actually stayed out past 10:00pm (I know, that still seems a little early), but the most important part of the sleepover is that we were still in bed sleeping at 8:00am this morning!!! Thanks for taking care of our kiddos so we could have some grownup time, Hobbs-Goodman family!